A photograph of a corner of the Civil Suite at the University of Canterbury after the 4 September 2010 earthquake. The photograph was taken on the day when the staff were allowed to return to the building. 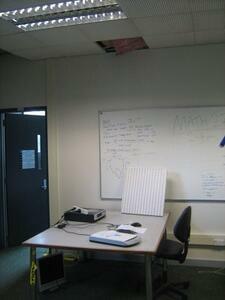 One of the ceiling panels has fallen onto a desk below, exposing the insulation underneath. 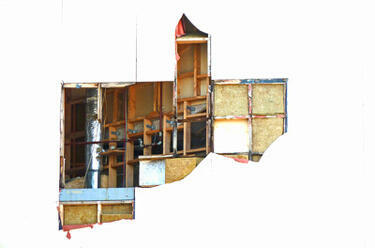 Broken panelling on a building on Colombo Street has exposed the interior of the walls. 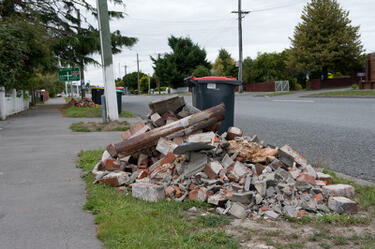 The photographer comments, "Seen in the Christchurch Earthquake Red Zone. If you saw this anywhere else in the world you would have thought that it was a piece of modern art".